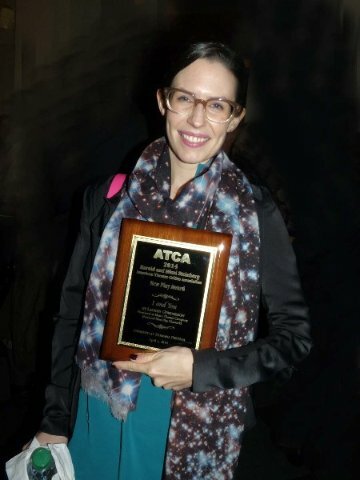 Lauren Gunderson repeats as an ATCA award winner. Giuliano photo. Playwright Lauren Gunderson has done it again. Four years after she received a top award from the American Theatre Critics Association (ATCA) for her play I and You, the writer recently won the same honor. This time, Gunderson's play about contemporary people trying to preserve Shakespeare’s words has won the Harold and Mimi Steinberg/ATCA New Play Award. "It's a play about playmakers (and) theater 'wrights, so I share (the award) with all the theatre artists that have made me and this play full of heart. To Will!," Gunderson wrote on her twitter feed. The Book of Will bested five other works in the running for the prestigious accolade. Steinberg/ATCA recognizes playwrights for scripts that premiered professionally outside New York City during 2017. Plays produced in NYC, where theater professionals present many awards, are not eligible. By receiving the Steinberg/ATCA award for The Book of Will, Gunderson has become the first repeat winner. The play had its world premiere at the Denver Center for the Performing Arts from Jan. 13-Feb.26, 2017. DCPA commissioned the play, whose development took place at the 2016 Colorado New Play Summit. Artistic directors representing theater companies around the country have scheduled productions. The piece is an “insightful and wry meditation on preserving artists’ legacy after their death, in this case Shakespeare,” reads a news brief uploaded to ATCA’s homepage at www.americantheatrecritics.org. A committee comprising critics, who are ATCA members from around the country, selected finalists. The honor comes with a $25,000 prize and a commemorative plaque. The Book of Will “fires on all cylinders,” one panelist opined. According to another, “It wrestles with big questions. They include why we create and how we deal with death? What constitutes a legacy? And how a surpassing love for something bigger can make every sacrifice worth it. Other renown playwrights who have been received the Steinberg/ATCA award are: Moises Kaufman, Adrienne Kennedy, Craig Lucas, Donald Margulies, Arthur Miller, Marsha Norman, Robert Schenkkan, August Wilson, Lanford Wilson and Mac Wellman. Last year’s honoree was Man in the Ring by Michael Cristofer. Gunderson is “the most produced playwright in America,” according to American Theatre (www.americantheatre.org). The playwright cites this on her website, located at laurengunderson.com. Her 2014 play which won the Steinberg/ATCA honor, I and You, centers on two high school classmates who sit down to complete an assignment. "As these two let down their guards and share their secrets, this seemingly mundane poetry project unlocks a much deeper mystery that has brought them together. I and You is an ode to youth, life, love, and the strange beauty of human connectedness," according to a description at http://www.playscripts.com/play/2698. Critics at the time lauded the play. It is ..."a validation of the human experience and of the triumph of life over death," Tim Treanor wrote in DC Theatre Scene. "Gunderson's gift is the best thing a play can offer: we might be better people after seeing it." Nelson Pressle of The Washington Post wrote that I and You is "sharp and funny...Gunderson taps into a buoyant spirit...the touching, 'barbaric yawp' (Whitman's phrase) of these two deeply engaging kids." Other finalists for this year's Steinberg/ATCA were Linda Vista and The Minutes, both by Tracey Letts and Objects in the Mirror by Charles Smith. Critic Lou Harry, who headed the panel evaluating the plays submitted for consideration, said a lot of work went into reaching a final decision. “Once again, the panel has bowled me over with its rigorous and passionate debate,” said Harry, The Indianapolis Business Journal’s arts and entertainment editor. “Once again, playwrights and theaters from around the country have supplied us with plays worthy of those fierce discussions." Since 2000, the Harold and Mimi Steinberg Charitable Trust has funded the award. The late Harold Steinberg, a prominent real estate developer, founded the trust. He established it in 1986 in New York City. Steinberg was president of the Downing Management Corp., an active developer in Manhattan. He also built the first hotel in Manhattan in 1957 called the Skyline Motor Inn. ATCA, which was founded in 1974, is the only national association of professional theater critics. It comprises more than 200 members working for newspapers, magazines, radio and television stations and websites. The M. Elizabeth Osborn Award, honoring emerging playwrights, adjudicated by the same ATCA committee. The 2018 award, previously announced, went to Chelsea Marcantel for Airness, which premiered at Actors Theatre of Louisville’s Humana Festival. The Francesca Primus Prize, bestowing an annual $10,000 award funded by the Francesca Ronnie Primus Foundation, to honor outstanding contributions to the American theatre by female artists who have not yet achieved national prominence. The 2016 award (presented in 2017) went to Lauren Yee for her play, in a word. The submission period for the 2017 award (to be presented in 2018) has closed. The winner will soon be announced. The Primus Prize is adjudicated by a separate ATCA committee chaired by Barbara Bannon of Salt Lake City, Utah. For questions on the Steinberg/ATCA Award, contact Harry, chair of the ATCA New Play Committee, at louharrywriter@gmail.com. Call (415) 964-8040 or send an email to communications@americantheatrecritics.org for more information on ATCA. "Early versions of this play were covered by Berkshire Fine Arts in February, 2016! http://www.berkshirefinearts.com/02-24-2016_denver-playwright-summit-part-ii.htm"